MAN Diesel & Turbo has won an order to supply the main gensets for a multi-layer vessel newbuilding, recently commenced by Lloyd Werft Bremerhaven AG for British client, Ceona. The multi-layer vessel, Ceona Amazon, which will specialize in pipelines and subsea structures, will be equipped with two 9L32/44CR and four 8L32/44CR main gensets, providing a total output of 28MW. Each engine will be constructed at MAN Diesel & Turbo’s Augsburg production facility in southern Germany, and later transported to the company’s Frederikshavn, Denmark site for a full electrical test before the gensets’ delivery to the shipyard. The 32/44CR has gained a strong foothold in the offshore market due to its second-to-none power and SFOC. MAN Diesel & Turbo reports the new order as being the third significant 32/44CR order the company has secured in the offshore market this year alone. Based on a drill-ship design, the Ceona Amazon boasts exceptional sea-keeping characteristics making it ideal for operations in remote and challenging locations. The multi-layer vessel is a large, state-of-the-art, multi-functional, dynamically-positioned, construction vessel. 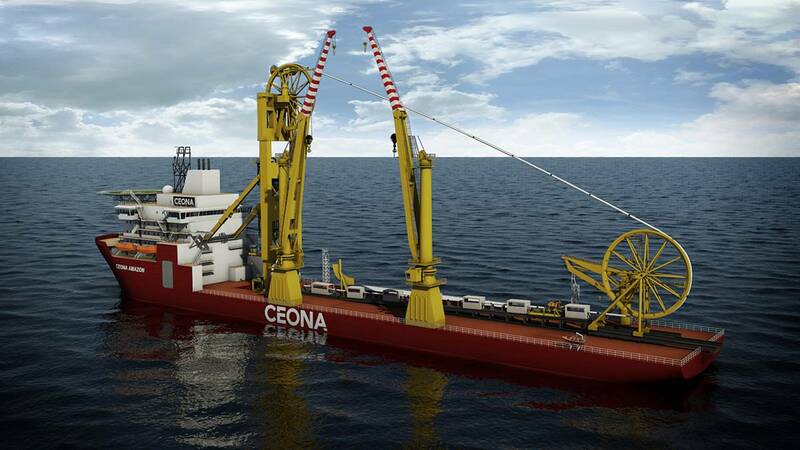 The Ceona Amazon has a large, under-deck storage capacity for line pipe or umbilicals, together with a large deck area that allows the further storage of line pipe and standard, flexible installation reels. The vessel is fitted with two heave-compensated mast-head cranes, and a single heave-compensated knuckleboom crane. The pipelay system consists of an inclinedlay system and a rigid, pipeline firing-line system. The vessel can lay rigid pipelines, flexible pipelines and umbilicals, and can install large, subsea structures using one or both of its cranes in tandem-lift mode to 3,000 meters depth. It doesn’t require a spool base to support its operations and can be remotely operated, making it extremely well-suited to overall field development.